After 3 weeks giving my arm rest, we planned to ease back into boating gently. We picked the Wye. 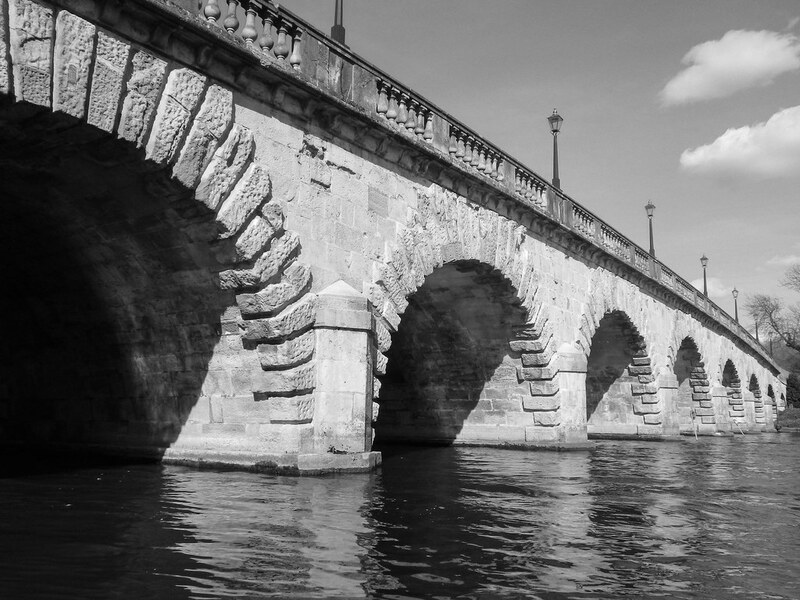 A well flowing river with no locks or portages wouldn’t put undue pressure on my injury. We know it well so any ‘epic’ day are unlikely. 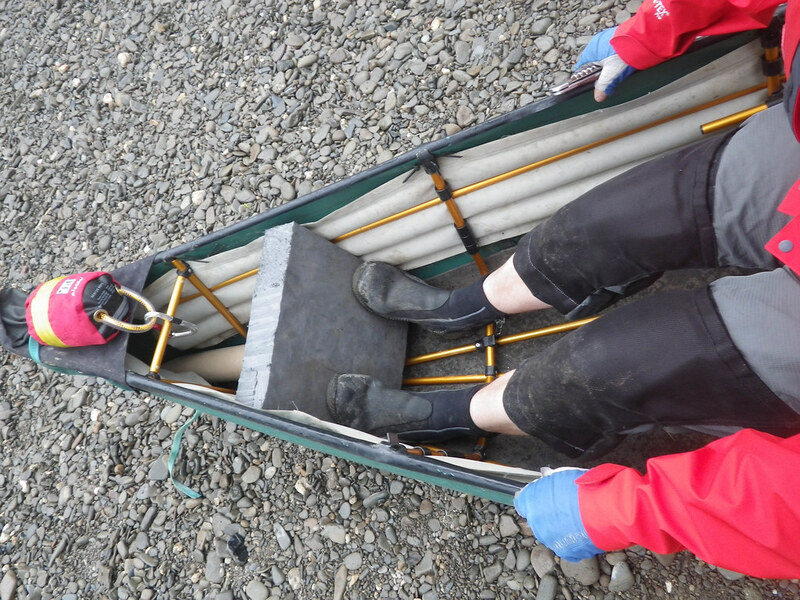 We also knew our chosen put-on would give us space to build a footrest allowing me to change my paddling style and not injure myself. Building the footrest was easier than expected. The river seemed rather further away than usual giving us lots of space to work. This was due to there being rather a lack of water in it. Once on It proved to be a challenge to get down the river without getting caught on rocks and gravel. Our boat really doesn’t like gravel. 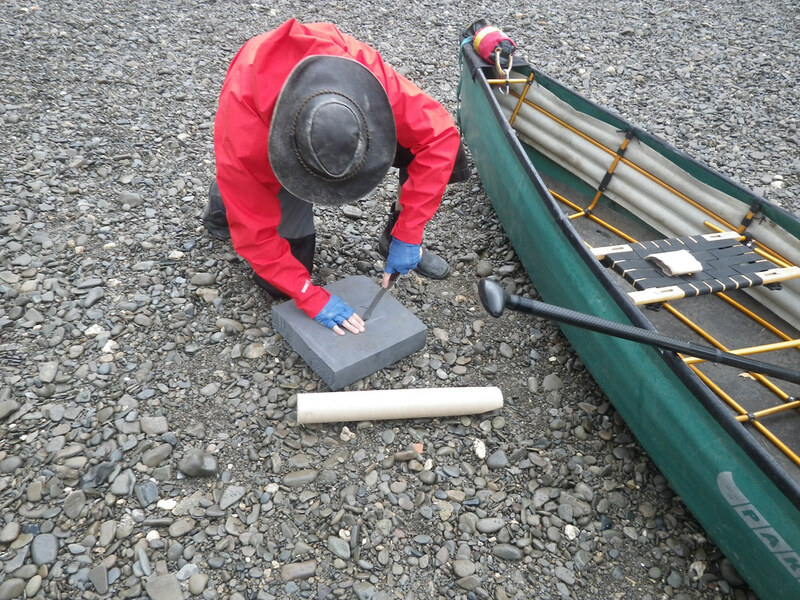 In solid plastic boats – you can give it a little push and scrape and you’ll be over it in no time. Our soft folder likes to stick, and dragging risks putting cuts and wear in the thin layer that keeps us floating. 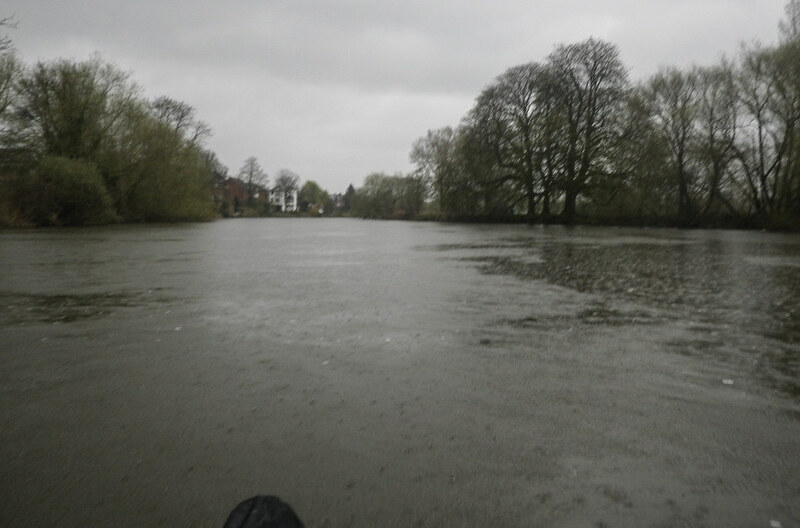 This new river condition meant looking forward and reacting quickly – well it should have done. Instead it meant lots of bad communications and misunderstandings, so we had to stop and talk about what was and wasn’t working. We were both were tired and making mistakes from hard week and a very long drive and late arrival. We were probably low on fuel and helped each other by ensuring we ate and drank lots. As we got further down the river we found it was much fuller in places giving us some time to relax, drink and snack. Even though there wasn’t water in the river, there was in the air. We got to test out our new rain coats out all day. Good news: they were great, keeping the rain off without getting damp and sweaty inside. With so little water we planning a slower speed and less distance to protect my shoulder and arm injury. We had a great day getting everything about right. I was still achey at the end of it, but paddling without painkiller. My achy gluteus maximus the next day an indication that I was starting to get my legs to be working in my paddling – the footrest was working. 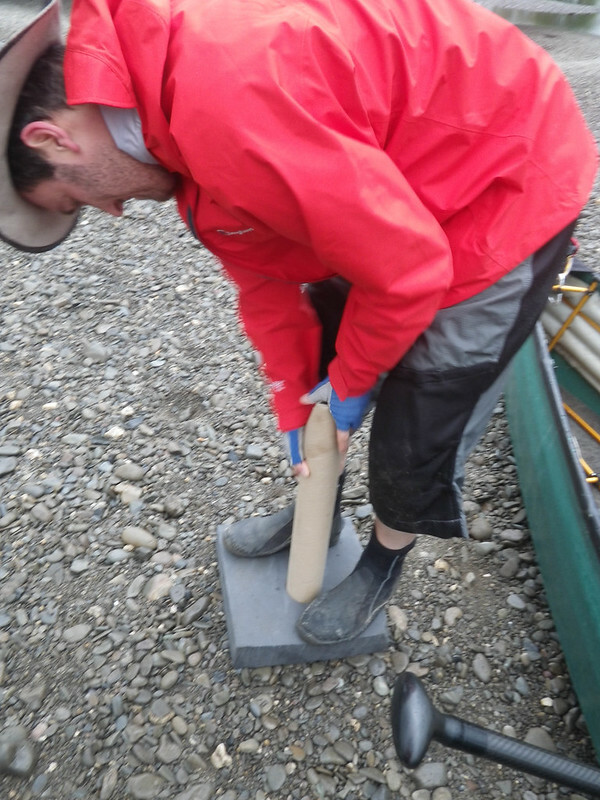 The Yukon River Quest is going to be longest I’ve ever paddled. Our training paddles are to get us ready and to learn what we need to do. An injured arm from our biggest paddle was feedback that I’m not getting it right. I’ve been working on finding how to get better so I can do the race. I’ve been having a few weeks off paddling – giving my arm time to recover. A physio probed and ultra-sounded and luckily couldn’t find any lasting damage. They did see a whole bucket of postural fails that likely cause the paddling pain and the arm injury. I’ve got plenty of exercises to help me grow strength and awareness – stop using the arms and the shoulder and use my core. We also worked to build me a footrest that will fit in the boat. One that we can rebuild in the boat we will do the race in. For those not in the know, if you want to paddle far or fast you need to be using not just your core muscles in your tummy and your back, you also need to find ways to use your whole body, getting your legs and bum also doing the work. For that to happen I need something for my feet to push against. 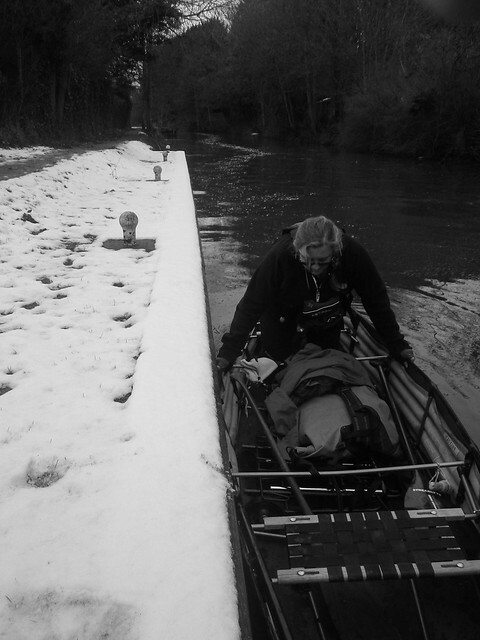 Our first opportunity was at the start of training paddle on the Wye. Sarah had got some closed cell foam and I found some cardboard tubing and brought some some tools. The foam is what I’ll push against with my feel; the cardboard will support and keep the foam in place. Building went quite easily. The foam was cut with a bread knife, the cardboard with my folding wood saw. Building a joint was an experiment that seemed to work well. Of course the cardboard tube isn’t ideal – its a prototype at best – but it seems to keep on working, until it rains anyway. 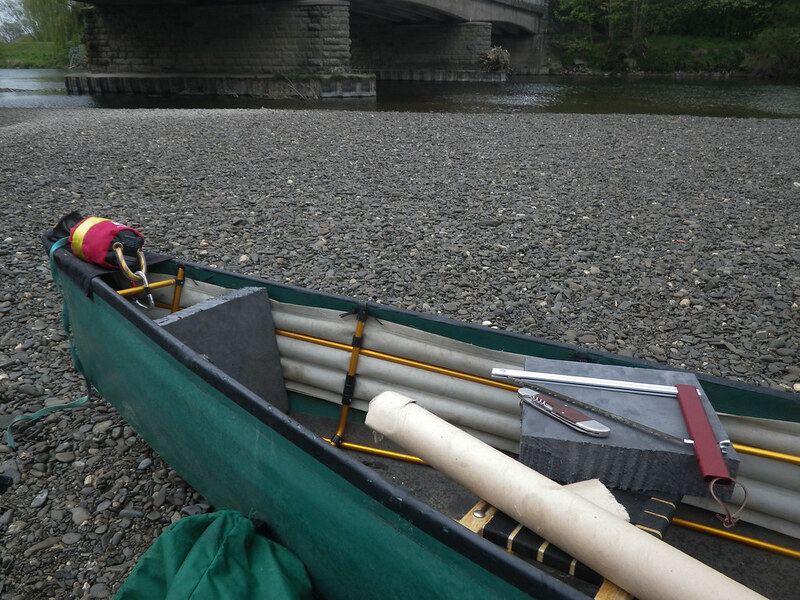 Next step will be to replace it with PVC drain pipe and see If that is a more waterproof solution – I’ll have to make sure the Pipe edges don’t cut through the foam, or the boat though! 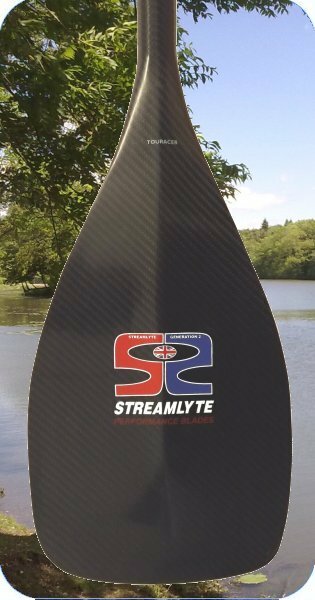 It worked really well in our last 2 paddles, power transfer is super. I need to learn another paddling technique and to get my posture right when driving from my feet, but its been great. We know that one of the big challenges of the race will be Lake Laberge which is 30 miles long. That’s a long way to go with no flow, longer than we had done so far. 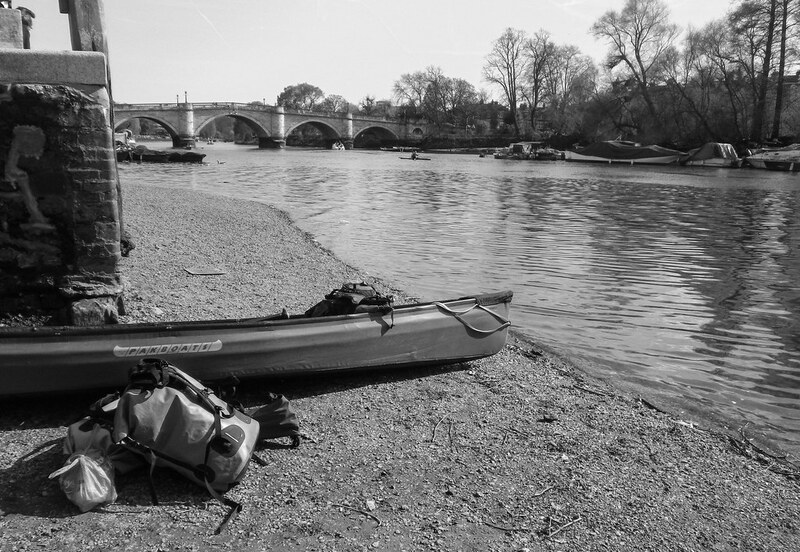 To get confidence we planned out longest paddle – from Reading to Richmond 60 miles over 2 days. The extra kit of tent, sleeping bags, cooking kit and food for day 2 really made a difference and portages were out. More traffic on the river meant there was more chance of getting through locks without having to wait too long. As we set off heavy rain fell, for about an hour, what a pleasant start to our day. It’s all good practice as there is no controlling the weather on the Yukon. It can go from sun to heavy rain very quickly. Spirits were up when we reached St Patricks Stream breaking off the Thames, skipping a lock and the sun came out for a minute. We were on the look out for that turkey, but there was no sign of it. I wonder if that was Easter Sunday dinner? 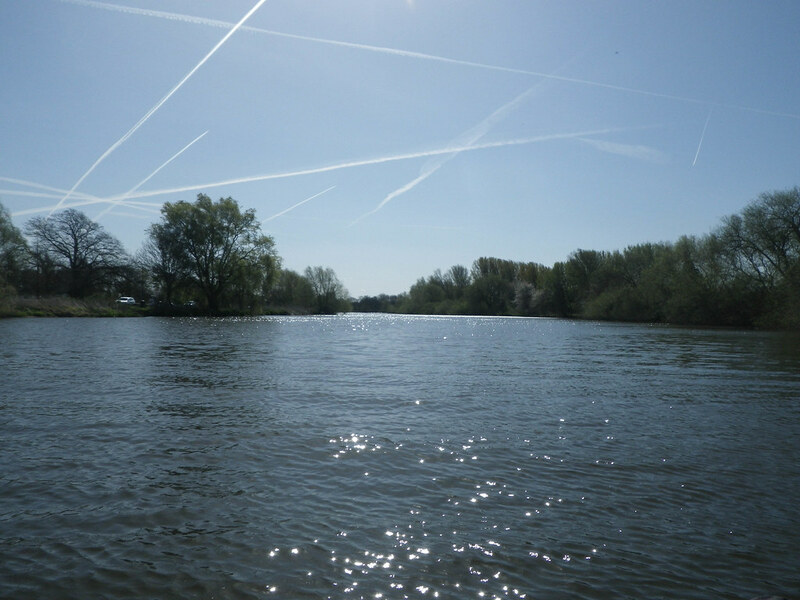 Our backwater fun was over soon enough and we were back on the Thames. Heading past Paul Daniels’ house we kept a look out, but the return of the bad weather was keeping him inside. We soon reached Bisham. Just a couple of trips ago this was the end of our day’s paddling, but we still had 4 hours to go from here! 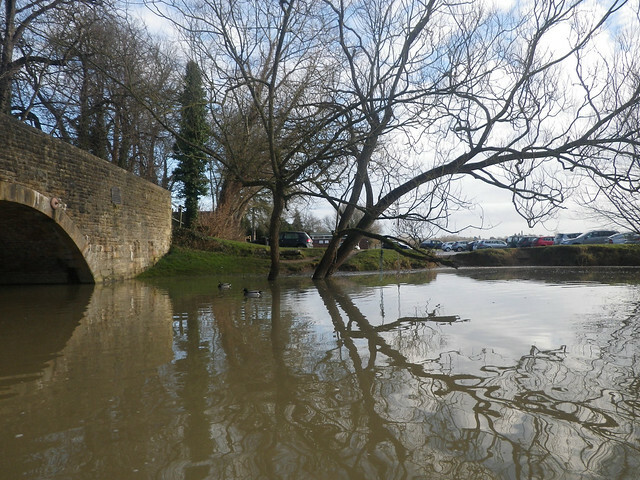 It was slow going – debris was just floating and not moving downstream. With absolutely no flow we knew that doing 35 miles was going to be a harder day than we expected. At Maidenhead we worked out there had been a misunderstanding on the amount of drinks we had with us. In brief, I had packed none. A co-op was spotted from the bank and as the day was getting warmer, a quick dash was made. Still a way to go. We slowly wound our way past Windsor Racecourse, joined by large tour boats. As we try to cut off a corner, I may have steered us a little close to one. Whoops. Romney Lock, so close. The portage here isn’t good and we lost time locking through, but the thought of a tricky portage would move us to tears. Once through, we were on the final run. By now Dan has gone very QUIET and is really giving it some welly. Not a good sign. By 7pm we get to Old Windsor Lock and the campsite he is pooped and so am I. No time to stop though. Everything has to be carried to the campsite, the tent put up, sleeping mats inflated, sleeping bags put out, us washed and changed. It had been a tough day but, we got there, in our short and wide Pakboat. The sleek lines of the racing canoe that’s waiting for is in Whitehorse must help a bit. I hate cold camping. 3am and I need the loo, can I avoid it, no. Apparently I made rather a lot of noise, waking Dan up who thought badgers had invaded our tent. Proper sleep came just as it was time to get up and the jets from Heathrow started going overhead. We thought that camping would mean that we could make an earlier start in the morning – nope. 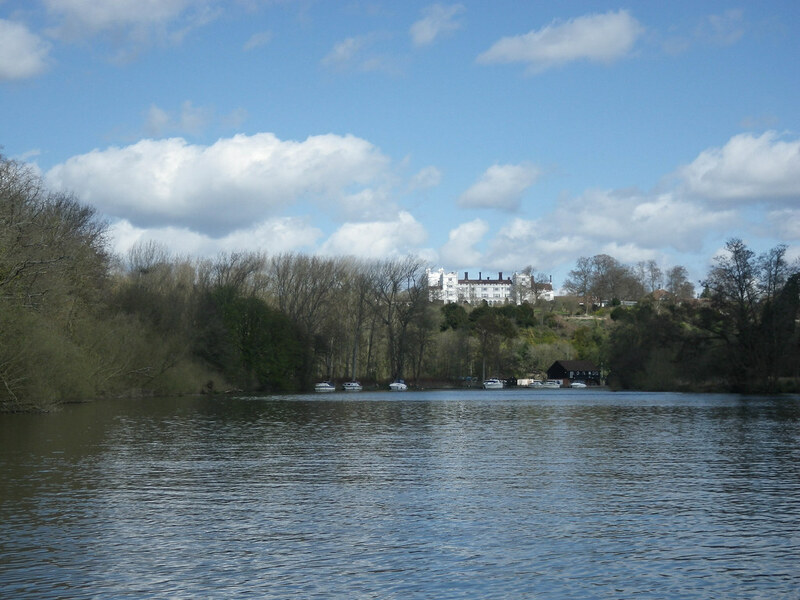 We were on the water at 9am, heading past Runnymede – it was nice to see the skiff club out. This was a section that is becoming increasingly familiar but boy was it windy today. There were some fantastic jet patterns in the sky. Perhaps trying to make up for our early awakening. Towards the end of the day we passed Hampton Court Palace,all of the pleasure cruisers out on this stretch which was busy in the sunshine. This was one of the few locks that we portaged as it has some lovely rollers to make getting to the other side of the lock so much easier on the back. Compared to Saturday, Sunday was a more relaxed day. Less distance to go although we still wanted to be home in good time. However muscles were aching and we may have been going off this paddling lark a little bit. That must mean it’s time to crack out the quiche. We love a good quiche, it makes everything a lot better. Looks like I’ll be making quiche when we get to Canada unless we can find some that meets the standard there. One of the big things we are playing with at the moment is what food keep us going, what brightens the spirits and what we want to avoid. Pasta and meatballs is still a winner! We made it, aching but pleased, but the next day Dan’s arm looked rather broken. Its good to know that we can make the distance but now we need to make it so we can make the distance while staying ready to paddle for another 3 days! Half a million strokes. Time to see the racing doctor. Valentine’s day means a special treat. In our case it meant a trip to Reading, to Marsport who are specialists in racing canoeing. We spent a bit of time with Paul, who then sent us off to practice for a few hours. You see I’ve been doing this canoeing thing for maybe 6 years now which is way long enough to have built up lots of learnings that won’t suit a ultra-marathon style paddle. What might work to get me down a few rapids or an afternoon along a bit of Lake Superior, isn’t going to be what ultra-marathon canoe race needs. Half a million paddle strokes is what Paul said we were likely to be doing over the 4 days of the race. Put like that, getting each stroke to go gently on our bodies is as important preparation as time planning and distance training. We started the morning on a canoe ergo. It’s a rowing machine for paddlers. We used to it look at technique – what we do wrong and what we do right. There’s a lot of arm positioning that contributes to the shoulder pain I get when working on the distances. As for Sarah she needs to remember to punch more (the water, not me). 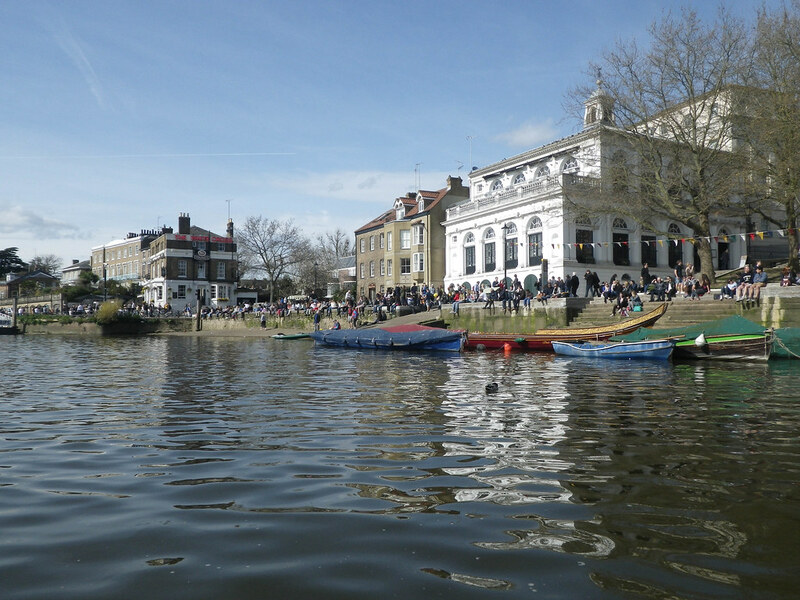 We then moved to paddle circuits on the Thames outside the shop, with a light-weight carbon fibre paddle that’s more suitable than my lovely wooden paddles. Again we got feedback as we went around to try to move to a safer paddling style for long distances. After an hour Paul felt we were ready to practice what we had learnt, and we borrowed a boat and headed up the Thames. 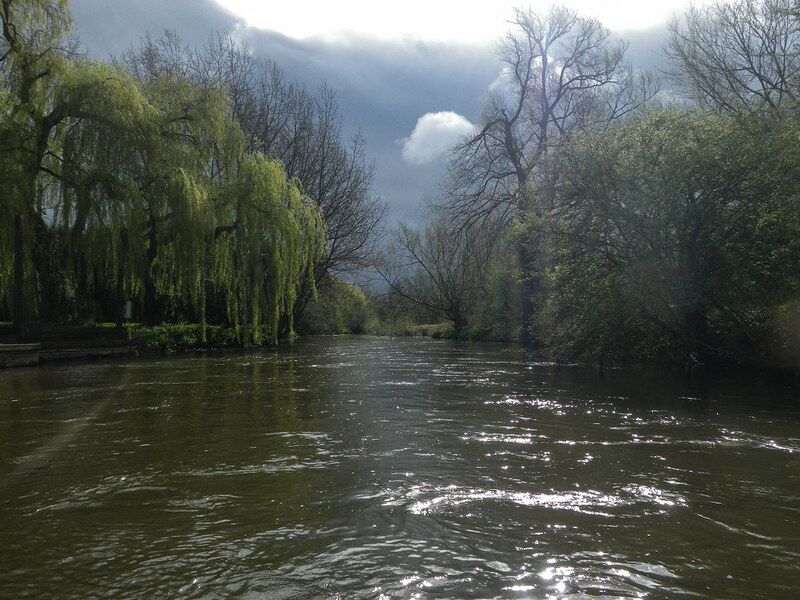 There has been a lot of rain the night before and the Thames was rising, meaning we had a tough paddle up river. We made a good pace and Sarah reported that with the new paddle she needed to steer a lot less and could work less hard in the back. I worked on my body rotation whilst sitting up (I’m used to kneeling) and trying to get my hands in the right places at the right times. The aches and pains afterwards suggested I’d not got it right. More practice needed. On the other-hand I now have a bargain cosmetic second carbon fibre paddle to train with. 3 hours 15 mins paddle including a stop for lunch. After our twice round Oxford trip it was time to step up the distance. We wanted something travelable to by train as it makes it easier to plan and I don’t have to drive afterwards. 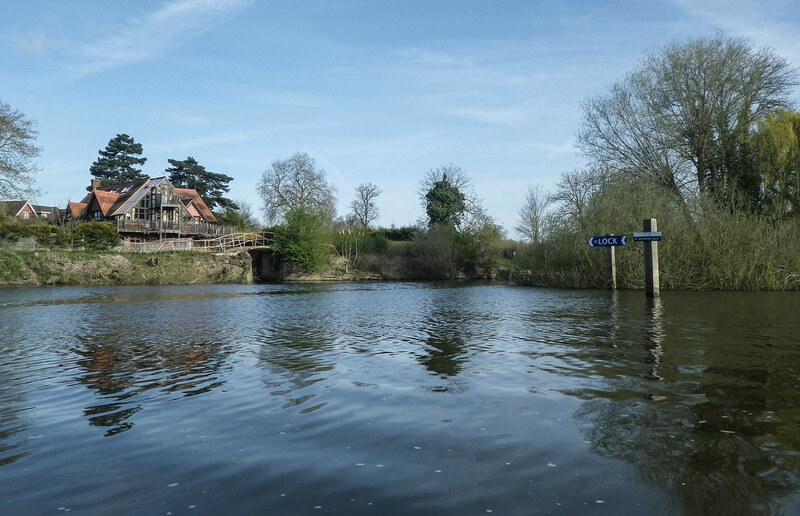 The Cam between Cambridge and Ely was our ideal plan. However the rowers had other ideas. On the day we planned, a big section was being used for a race and others can only use the river under control of race marshalls. Standing on the bank in the cold for an hour wasn’t in the training plan, so we replanned. We took the train out to Bishops Stortford having packed up as little kit as we could. Getting on and started was easy. It was going well until we hit the ice. We’d got to a stretch where we there was repair works to a lock. The stillness of the water meant that the river had frozen. We bashed through a bit but it was not good for our soft PVC pakboat so it was time for a carry round. I hate boat carrying. 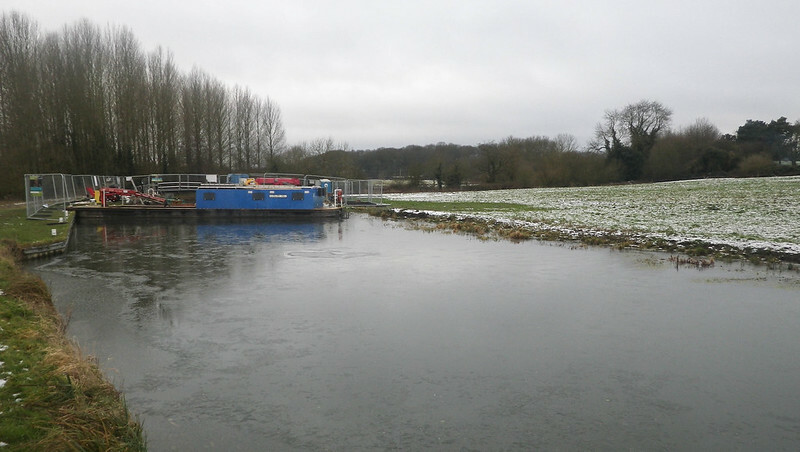 We were finding it tough with the cold and the amount of portages round locks so an extra long carry was not welcome. We kept on, and despite losing time early on, picked up speed. Then it started to snow. Big flakes of snow. It settled on the bags and the bottom of the boat. And us. Brrrrrr. As the snow fell, the reflection on the water made it look as though it was coming down and heading upwards again. It was only going to get stranger. We made the miles pass with an A – Z of what we could have for tea tonight. It got a bit silly towards the end of the alphabet although Dan did need to know that Sag Aloo does not start with a P, even if it is made with potato. Around the locks we were trying to have very minimal time off the water. We were getting good at the portages until we hit the Lee. 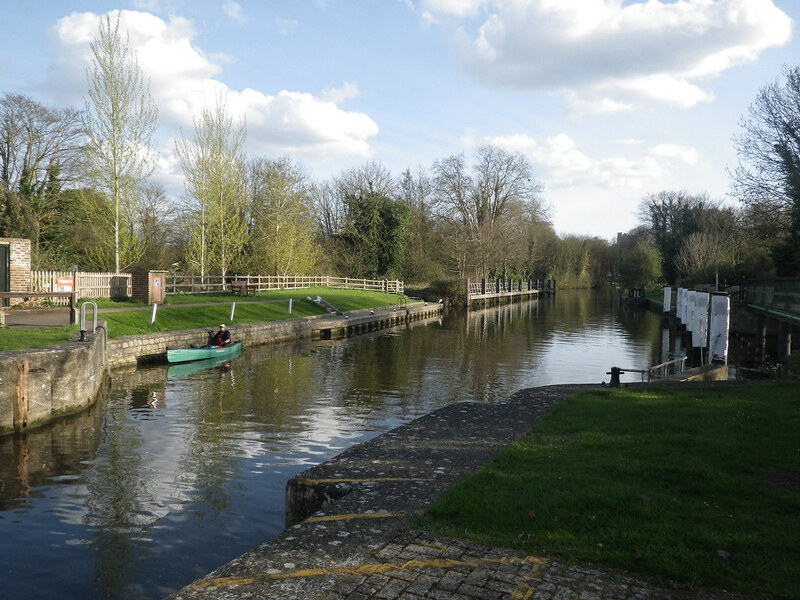 The locks on the river Lee have been designed to take industrial traffic and where a lot of the Thames has been adapted to provide lower portage points for canoes and kayaks these are lacking. A lot of standing up in the boat is needed and some of the portages required me to lower myself down into the boat from the bank 4 foot above. 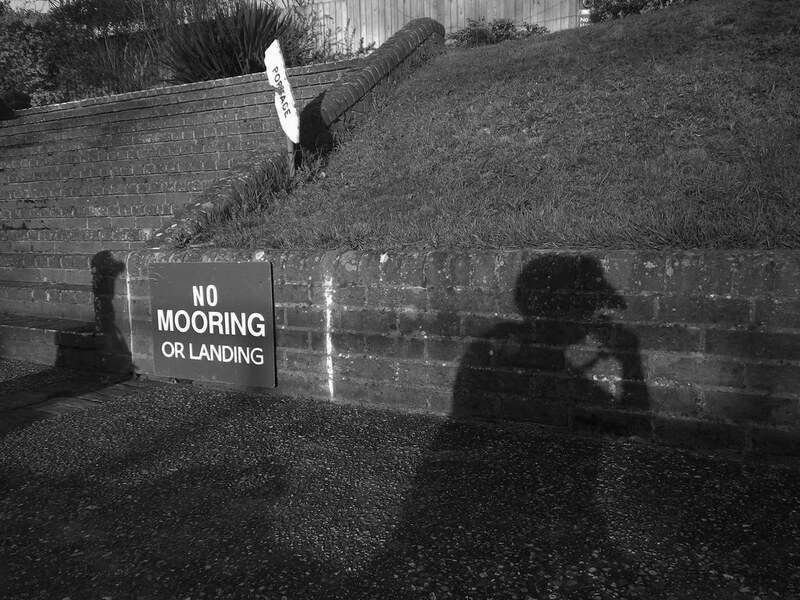 I find this really tricky – having had balance issues in the past I find boat to land transfer tricksey. Dan holds onto the boat as I get in and I may have tested his temper a little with my hesitancy and apparent need to tip the boat up. Ho hum, I’m sure the friendly fisherman appreciated my yelling at Dan. We kept paddling and despite being slowed by tricky portages we were still on time for our get off. We were aiming to be off at 4pm and at 3.50pm we pulled in. The boat was quickly disassembled (without being dried – oops!) and we headed for the train station. A quick change of trousers was in order on the train as mine were soaked and Dan struggled out of his dry suit standing next to the luggage. We were soon home. Paddling close has its benefits. “Paddling was horrific. 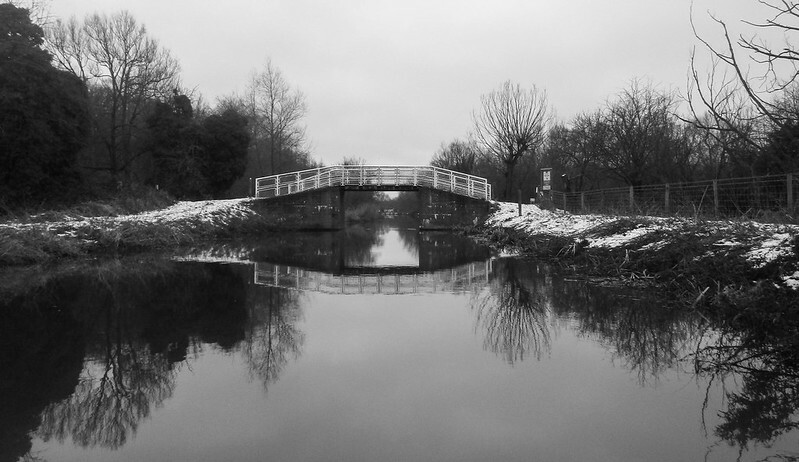 it snowed for 2 hours, it was so cold the coffee in the flask got chilled, we had 19 locks to carry round, and 1 carry around 200 metres of frozen canal. 29 km in 6 hours. 3 arguments, 2 big hugs. Just about no tears. Every paddle stroke got us a few feet forwards. But as we took the blades out of the water we lost momentum. The boat started to be tugged backwards, like being on a treadmill. I didn’t think that’s how you trained for a canoe race. It’s January and Sarah and I are committing to paddling the Yukon together. 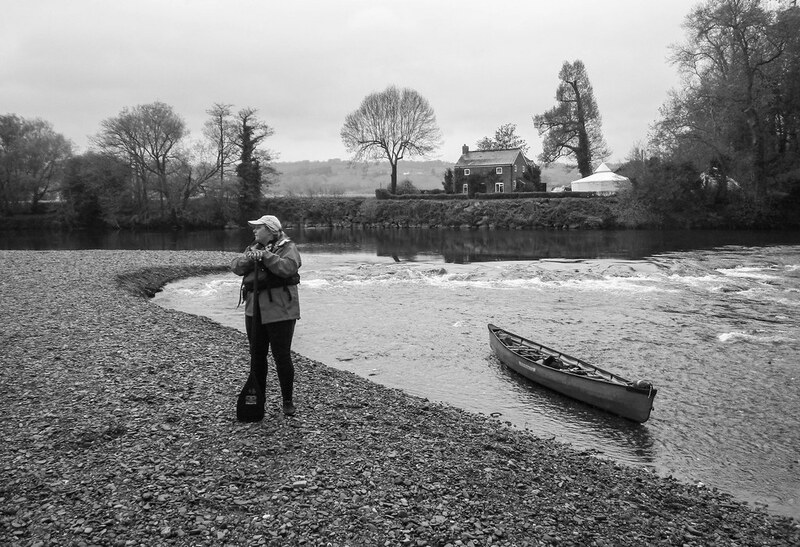 We’ve drawn out the training plan for the next 2 months and this weekend was our first training paddle proper. A look at how each of us is doing and what we need to learn. We chose the Oxford Circuit cos it’s a looping route that means we don’t have to worry about where to park the car. We are likely to be doing our training on the River Thames. 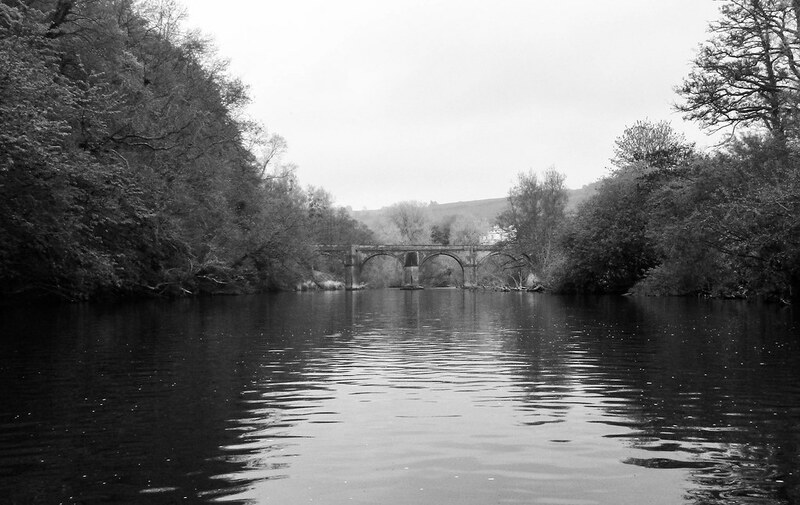 For most of its length It’s a managed navigation, an adapted river that has locks and weirs to manage the flow. Most of the year it sits at a happy level and boats of all sizes abound. 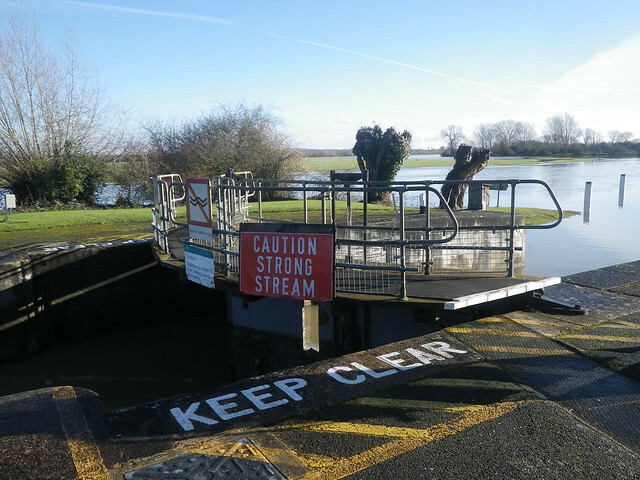 When the river gets fuller and the flows get stronger, yellow boards go up on the locks as a warning. When it’s proper high they put up their red boards and ask people not to use the river unless they know what they are doing. We knew the Thames was going to be high. It was probably the fullest we’ve seen it. It was a cold too, so we had the ‘what will make this a safe and good day’ discussion. We checked a few points of the river to know our options. Fast rivers can be fun rivers, but not when you can’t get back to the car. We were happy we had options, but we agreed this wasn’t the day for pace training, we would be working on communication and problem solving instead. 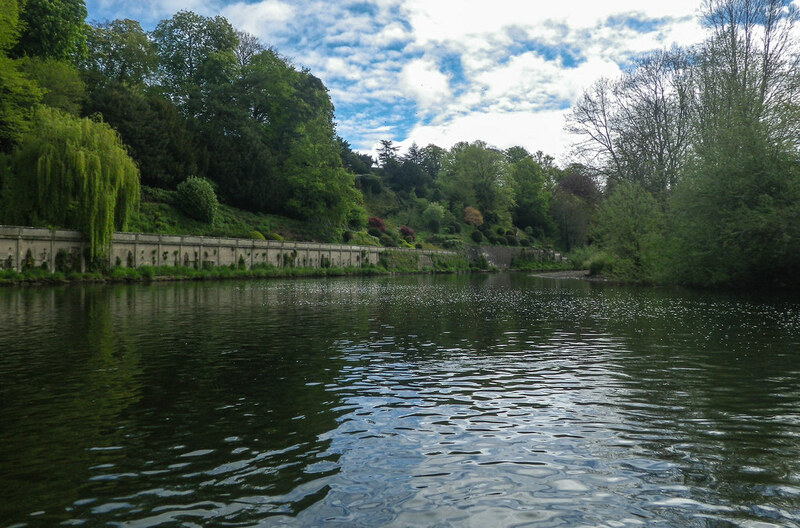 Our first mission was to break into the outflow of a weir – something that usually causes a differing of approaches from the ends of the boat. The front wants a powerful dynamic entry to the fast-moving water, the back wants to gently move into the water lower down the outflow where there is less of a kick. As the front traditionally powers the boat forwards and the back provides the steering, you can see how this may have contributed to frank discussions of paddling ability. We got it right, you’ll be happy to know. Right meaning talking, trying what we talked about and being happy about the result. Good times; unusual times. So we continued, speeding down the Thames and then turning for the hard slog up the canal that’s a straight run, just two locks to carry around. Turning off the canal, back to the Thames, we knew the challenge of the day was ahead. Joining the Thames in the flow to Kings lock’s weir, we needed to paddle against the huge flow of the flooded Thames for 100 meters to get us into safer waters. Don’t worry gentle reader, we had several bug-out plans, but we needed to paddle absolutely solidly as a pair to not need them. It was hard, each step forward was half a step back, but we made it up river to the lock turn off and manoeuvred across the river to the lock channel, never once drifting back panicking or not trusting one another. Portaging Kings lock itself and some wiggles down the fast flow of the Thames got us back to our starting point. We coffeed and snacked at the lock and decided we were good for the second go-round. This time aiming for a time of less than 2 hours. 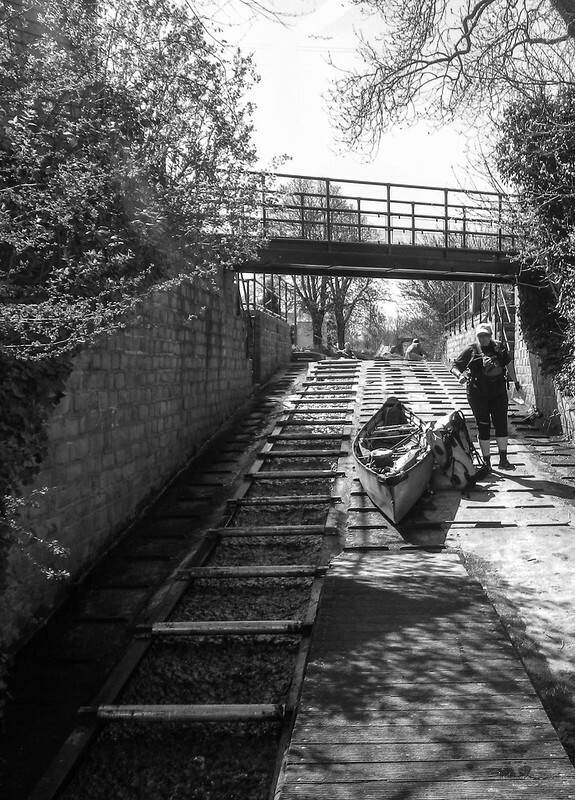 The second slog up the canal hurt. Aches in my shoulders and back developed no matter how I sat or how much we swapped paddling sides. I can still feel them a day later as I write this. We made it round the circuit in 1 hour 55 mins. Choosing a route down a mill stream to avoid doing Kings Weir again – we knew we weren’t up to it twice. It felt a lot different to our previous paddles. There’s less stopping to appreciate where we are, the cadence is higher, but we are trying to chat more. Listing out puddings, making jokes, creating fun. If I want more communication with Sarah, I’m going to have to help create it. We do go quieter as we get tireder – we’re gonna need to work on that, it’s going to either damn us or save in the race. Eating and drinking on the move is going to be a challenge too. I could tell I got dehydrated and didn’t eat at the right times. If I’m the engine to get us to Dawson I’m going to need to do that better and build up my endurance. We paddled 14 miles in four and a bit hours. I will need to 8 hours to just cross the lake at the start, and then keep on another 3 days and night down the river. This is going to take some more work. Dan and I have been arguing together in canoes for around 8 years now and the strength of arguments does seem to be decreasing. It has been over 2 years since Dan last jumped out of the canoe to get away from me. In 2013 I did the world’s longest annual canoe race, The Yukon River Quest, with Esther. I missed Dan and I spent a lot of time doing things away. I wanted another bash and set about persuading Dan that he too wanted a go at this. Persuading him to the idea/concept was the easiest part. That we had time to train around work was quite a bit harder. That we could spend that much time in a boat together, without killing each other, was by far the hardest. We set about doing a few paddles tandem just to see how they went, around Oxford and then on the Wye. Things were looking up. We had progressed from all out rows to stern discussion and only a couple at that. Therefore, at that point the decision was made. On 24 June 2015 we will start the Yukon River Quest, aiming to get 444 miles down the river before the end of 27 June. This weekend we sat and determined the training plan through to June. Sarah will be losing weight and Dan will be getting strong. We plan to focus on long day paddles with gym training in the week and downtime. The boat is hired, accommodation booked in Whitehorse before the race and now to build a holiday around this silly idea. We haven’t yet submitted the entry. There are 28 boats entered. Boats no 26 onwards get an extra 1/2 hour in bed on the start day and I am waiting until there are 30 in front to guarantee that in case of drop outs. I think everyone else is waiting for the same thing. 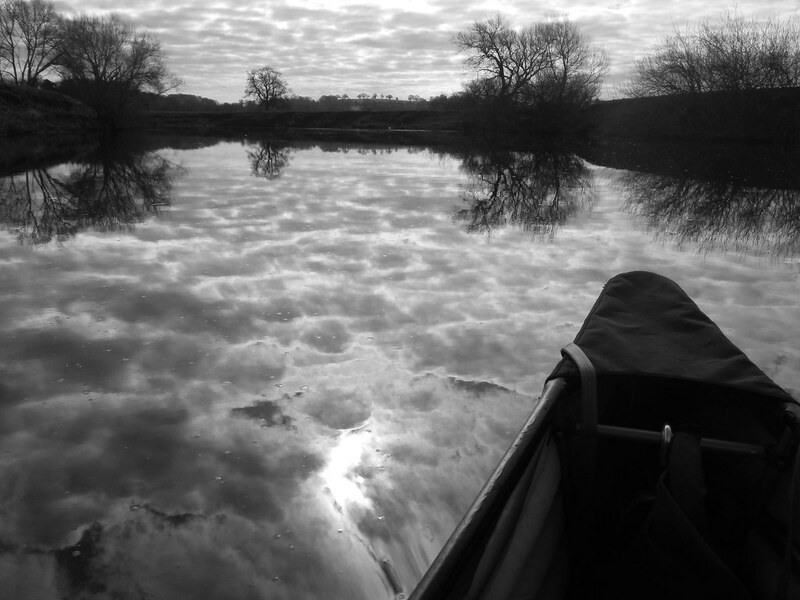 This weekend we are off for a long paddle with as much of the light as we can use. It’ll be Dans first experience of the no stopping for a coffee and eating by throwing a few mouthfuls in every couple of hours. With the forecast for extreme cold we may have to submit to a coffee stop. There will be all sorts of fun to report as the weeks go by, along with our fundraising attempts for Shadwell Basin Outdoor Activity Centre. As was the case with Barely Scared in 2013 if you have questions, advice or comments please get in touch.